Without an heir, the kingdom of Kazath is in chaos. You are poised to take the Onyx Crown for yourself, but power rarely comes without cost. You must use those around you to achieve victory, raising your army to build your legitimacy, forging temporary alliances... and plotting their inevitable betrayals. In the end, only one can Reign. The golden rule in Reign? You never have to keep your promises. You can be honorable or ruthless. But choose your allies wisely - your sworn battle-brother in one round could easily betray you in the next. 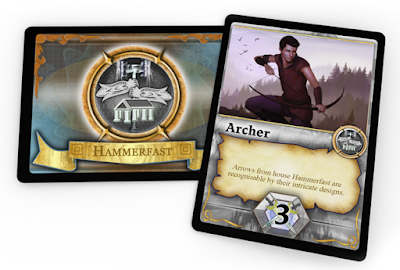 Choose 3, 4, or 5 Houses to include, depending on the number of players, then shuffle the military cards of those Houses into a shared deck. Place this, along with Event cards, House support cards and the Onyx Crown itself into the center. Draw starting hands, and the conflict begins. Secretly bid for the favor of a House using military cards of that House. The support of a House increases the power of their military cards in your army, and you cannot take the Regency and ultimately claim the Onyx Crown without it. Will you try to take the Onyx Crown for yourself or ally with another player for the promise of reward? You can publicly support yourself or your ally by playing a military or event card face-up into their army... then covertly place two more cards face-down into any player’s army to keep your opponents guessing. Each House has their own unique military unit, with a powerful ability that can turn the tide of battle in your favor. Use special event cards to gain the upper hand. Use brutal betrayal cards to sabotage your rivals. But be warned, they may choose to seek revenge! Armies are revealed, and the greatest force takes the Regency and the Onyx Crown for the next round, moving 3 legitimacy points closer to the 9 required to win. Anyone who supported their success gains 2. As Regent, you choose how to distribute the spoils of war. Will you be an honorable and generous ruler or will your greed overcome you? Don't forget, there is no second place. Reign is up on Kickstarter and will be running from the 16th of January to the 15th of February. Pledges start at $19 USD and shipping is free worldwide.